Okay, I asked you for questions and/or topics, and you gave me some, and I’m going to start taking a crack at ’em today. And, if you want to add to the list…feel free! Well, sure, Rich, start me off with something easy, why don’t you? Now there’s the thing…I think, almost inarguably, the two pinnacles for the character are the original Len Wein/Bernie Wrightson comics from the 1970s, and the Alan Moore/Steve Bissette/John Totleben/etc. of the 1980s. Trying to pick which one is better than the other is almost impossible. Perhaps the Moore-era books are more effective in evoking a more modern-seeming feeling of horror, but they wouldn’t exist without the groundwork of the Wein/Wrightson stories. Also, few are the people who were better horror artists than Bernie Wrightson. In a way, both runs tread similar ground, in that they explored some of the more traditional horror themes (witches, vampires, werewolves, haunted houses, and so on) while giving their own particular twists on the topics. Getting down to it, though, if I had to pick one over the other, I’d give the nod to Wein/Wrightson, setting the bar so high right out of the gate, which is probably mixing metaphors a bit but you understand what I mean. It’s because of them that we expect a certain standard of quality out of our Swamp Thing s, and it’s disappointing when that level isn’t reached. Moore ‘n’ pals would be a very close second, building on Wein/Wrightson’s creation and updating the storytelling for current sensibilities. Ideally, if someone were to ask me which Swamp Thing s they should read, these would be the ones. As for the portions of the series by other creators…well, they all succeed at certain things in their own ways. The issues that followed Wrighton’s tenure featured beautiful artwork by Nestor Redondo…while the comics are not the legendary classics of the preceding issues, they are still excellent in their own right, and only probably overlooked now due to their lack of reprints (a situation about to change with the forthcoming omnibus). The Marty Pasko/Tom Yeates run that opened the Saga of the Swamp Thing series that returned the character to newsstands is one worth revisiting as well. Its lengthier storyline, pulling together a new cast of supporting characters and giving more of a focus on ongoing subplots, was one that, if I recall some of the letter columns correctly, met with some resistance from older fans of the character. Things were maybe a little too wordy, and subplots stretched out a little too long, for their tastes, though I suspect that’s more a generational change in reader expectations from serialized comic books. Multi-part soap opera-esque stories were more the norm at DC as the 1980s rolled on, perhaps inspired by the success Marvel had along those lines in their own books. 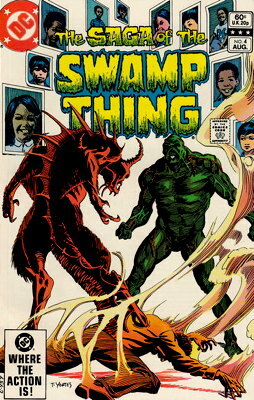 Looking back, the initial story wrapped up after only 13 issues, which…well, come to think of it, many stories nowadays come in 5 to 6 issue easily-trade paperback-able chunks, which are only approximately half the size of this Swamp Thing story. But, the point is, people are more used to not getting done-in-one stories in their comics today, which they weren’t back then, which may have affected their perceptions of this then-new Swamp Thing comic. Particularly since it couldn’t help but be compared to the classic ’70s run, which was mostly self-contained stories with only the barest minimum of subplots connecting issues together. That’s all discussion about structure, not content, I realize. I think Pasko/Yeates put together a fine run, presenting effectively scary stories within the confines of the Comics Code Authority that weren’t necessarily variations on traditional horror topics…okay, there were the punk rock vampires, but there was also a story about Vietnam vets, a story inspired by a then-recent spate of child murders, a medically-themed body horror story, a weird alien-possession tale, and the whole storyline ending up with [SPOILER ALERT, I guess] Swampy going toe-to-toe with the Anti-Christ, which was probably not something anyone expected, but there it is. It wasn’t the Swamp Thing of the 1970s we were used to, but Pasko/Yeates certainly expanded the character’s scope, paving the way for the Moore/Bissette/Totleben stories to follow. I hadn’t yet touched on the stories Bissette/Totleben did with Pasko pre-Alan Moore, but I think I’ll do so in Part II of “Mike Discusses How Good or Bad Certain Runs on Swamp Thing Were.” Yeah, there’s going to be a part two. At the very least. And I may eventually mention how this particular topic may be related to the special Patreon-only (at least temporarily) content I was talking about a while back. Stay tuned! Was the Pasko/Yeates run published bimonthly? I seem to remember it that way but could be wrong. I do remember thinking that the big story took a long time to resolve, at least as 12-yr-old me processed time and waiting in those days. The interesting thing about the Pasko run is that it did seem to drag month to month, but if you read it all in one sitting, it’s actually quite good. I definitely remember 14 year old me getting bored w the Pasko run and dropping the book after 2-3 issues. Was this the same time he was writing E Man for 1st Comics? That I loved. The “White Room” story was among the very first SWAMP THING stories I ever read, and it haunts me to this day. Hell of a thing for an 8 year-old to read, lemme tell ya.